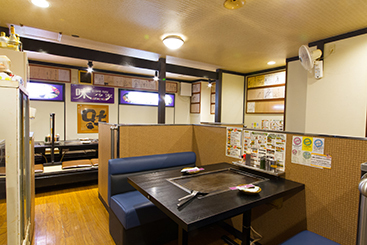 "Just like in the good old days, we grill our okonomiyaki right in front of our customers." 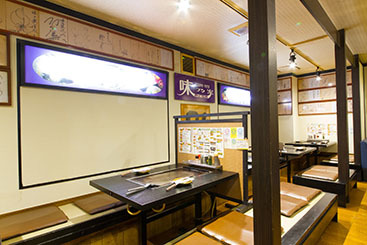 "Our staff whole heartedly grills each okonomiyaki pancake while you enjoy the sizzle and delicious smell of it being grilled and the fluffy texture of freshly made okonomiyaki." 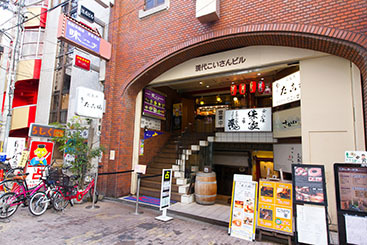 "You'll feel as if you've traveled back in time to an okonomiyaki shop of the old days in a local traditional entertainment district in Japan." Please be sure to come and try our okonomiyaki. 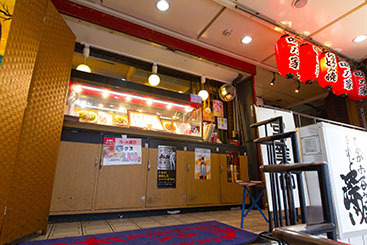 "Okonomiyaki & Yakisoba Aji no Ya is across the street from the backstage entrance of the Osaka Shochikuza Theatre." "Our shop is a 3-minute walk from “Namba Station” (exit 14/15-B) on the Osaka subway line."